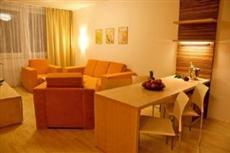 The Hotel Vista Brno is situated ten minutes away from the center of the city. Guests will find that the fairgrounds are quite nearby. Other nearby attractions include the Spilberk Castle and the cathedrals of Saints Peter and Paul. The Hotel Vista Brno offers a complimentary shuttle to the airport. Rental car services and taxi cabs are offered throughout the area, providing access to points of interest and attractions located throughout the city. All of the guestrooms at the Hotel Vista Brno are well equipped and boast free Internet access. All rooms offer desks, televisions, minibars, and complimentary newspapers. Each room is climate controlled and offers a private bathroom with a shower. All of the hotel’s guest accommodations are nonsmoking. Guests of the recently refurbished and redesigned Hotel Vista Brno will find a wide array of shopping and dining choices in the area. There is a golf course located right onsite. The hotel also offers a complimentary onsite parking area for guests with cars.